I have been playing with pastry. There are certain skills I never got around to developing in my years in the kitchen, and pie crust is one of them. There was a certain level of fear involved, I am ashamed to say. I don't know why I have been so afraid of such a simple thing. I suppose it's partly because so much pride is attached to a tender, flaky crust. The other part has to do with something that is unusual for me. I am usually quite adept at all things physical, so it came as something of a shock to me to discover that I could not perform the simple task of rolling out a pie crust. Or, to be more precise, I could not roll the pie crust out into anything resembling a circle. Something I have been learning in the kitchen over the past few years is this: If you want to learn a new technique, you simply have to do it. And do it again. And again. And . . . well, you get the picture. I first discovered this simple secret when I was trying to learn how to knit. At first I was all thumbs and tangled yarn, but as I persevered I began to be able to see the structure of the stitches, and once I could see that there was nothing I couldn't do. It's much the same in the kitchen. Of course your first attempt at something new will be less than stellar (unless you encounter that wonderful occurrence known as beginner's luck, and it does happen). But the next time you make the attempt you will have a little more knowledge than you had before, and you will be able to make adjustments based on that knowledge, and you will get a better result. And each time you try, you get better at making those adjustments until before you know it you are turning out a consistent, nearly-perfect product each and every time. This is related to my other newly-discovered Law of Three. That applies to a new recipe; when learning a new technique it can take more than three tries, for me at any rate. It took about eight times for me to get comfortable with pizza dough. By now I've made at least ten crusts, and I'm just now beginning to feel like I've got it. Earlier this summer, my friend Nicole, who had been in Washington state for quite some time, finally came home, and brought me a lovely gift of some bona fide original Walla Walla onions. They were big and round and absolutely beautiful. 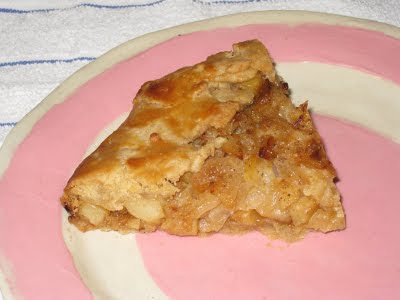 As I was working on my piecrust, I had already experimented with an onion tart or two, with mild success. None of them had gone anywhere interesting enough for me to share them here, but I felt that I had enough information to make something that would really bring out the sweetness of those beautiful Walla Wallas. And I was pleased with the outcome. 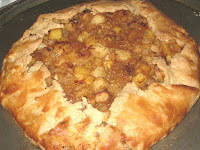 Rather than baking it in a pie pan, I decided it would have more rustic charm as a galette. I was going to link to the Wikipedia definition, but it appears that Wikipedia's definition is either a crumbly cake or a buckwheat crepe. I have seen the term widely-used, at least in this country, to describe a rustic free-form pie cooked on a baking sheet rather than in a pie pan, so I am going with that and am calling this a galette regardless of what Wikipedia says it is. I wanted the onions and the potatoes to be the stars of this dish, so other than salt and pepper I did not use any other spices. It was a wise decision. The flavor of the sweet onions is subtle, and just manages to hold its own with the toastiness of the browned potatoes. Any other spices or herbs would just have gotten in the way. And the crust came out beautifully, too. Flaky, buttery, rich and tender. Yum! I really love the free-form style of the galette. This is not a light dish. It's best saved for special occasions. Or when you are lucky enough to have some Walla Walla onions on hand. Hey - if you happen to find yourself in that neck of the woods, pick some up for me, will you? Prepare pate brisee. Dust with flour, form a disk, wrap it in plastic wrap and place it in the refrigerator while working on the onions and potatoes. Heat oil over medium-high heat in a large skillet. Add onions and cook, stirring frequently, until they have caramelized and turned a rich, deep brown. This will take about 20 minutes. Remove from the pan and set aside to cool. In same skillet, adding more oil if necessary, leave the heat on medium-high and add the cubed potatoes. Season liberally with the salt and pepper. Cook over the low heat, stirring occasionally, until the potatoes are well browned and almost tender. Remove from heat and set aside. Take the pate brisee out of the refrigerator and let it sit for 10 minutes. Roll it out into a 9-to-10-inch circle and lay it on a baking sheet. Place the onions in the middle of the circle, leaving a good two inches of the dough free. Top with the potatoes. Fold the outside of the dough up over the potatoes and onions, crimping as necessary and leaving a good six inches or so of the center uncovered. Using a pastry brush, spread the buttermilk or cream lightly over the pie dough. Bake for 50 minutes, until the crust is golden brown. Let sit for ten to fifteen minutes before serving.